ProQR Therapeutics has reached agreement with the US FDA on the design of a phase 2/3 clinical trial of the company’s RNA-based oligonucleotide therapy sepofarsen (formerly QR-110) in patients with Leber congenital amaurosis 10 (LCA 10) due to a mutation in the CEP290 gene. The trial is expected to start in the first half of this year, with some top line results to be available in 2020, the company announced in a January press release. The announcement of the phase 2/3 trial follows publication last month of interim results from a phase 1/2 trial evaluating sepofarsen in patients with LCA 10.1 That report included data on eight patients from a planned interim analysis at 3 months after a single treatment with sepofarsen. A substantive improvement in BCVA was seen in treated eyes, with a mean improvement of -0.67 LogMAR in treated eyes versus 0.02 LogMAR in contralateral control eyes (P = .011). The planned double-masked ILLUMINATE phase 2/3 trial will enroll an initial 30 patients who will be randomly assigned to one of three arms: two active dose levels and a sham control arm. Participants will receive a dose of sepofarsen or sham injection at the start of the trial, at 3 months, and then every 6 months. The primary efficacy endpoint will be change in VA from baseline in the treatment arms compared to control arm at 12 months. Sham-treated participants may be offered crossover to active treatment after 12 months, and all will continue to receive treatment for a total of 24 months. Sepofarsen is administered through intravitreal injection. A phase 1/2 trial of the therapy, which is designed to restore production of normal CEP290 protein in LCA 10 patients with the p.Cys998X mutation in the CEP290 gene, is ongoing. Separately, ProQR announced that it received fast track designation from the US FDA for another investigational RNA-based oligonucleotide, QR-421a, which is designed to address the underlying cause of vision loss associated with Usher syndrome type 2 and nonsyndromic retinitis pigmentosa due to mutations in exon 13 of the USH2A gene. 1. Cideciyan AV, Jacobson SG, Drack AV, et al. Effect of an intravitreal antisense oligonucleotide on vision in Leber congenital amaurosis due to a photoreceptor cilium defect [published online ahead of print December 17, 2018]. Nat Med. A compound that inhibits cell signaling in uveal melanoma cells may be a potential treatment option for patients with the disease, researchers at Thomas Jefferson University and other institutions suggest in a recent paper in Molecular Cancer Research.1 The compound, FR900359, effectively inhibits signaling in uveal melanoma cells expressing two mutations, Gαq and Gα11, that are found in approximately 93% of all melanomas. Although therapeutic intervention of targets downstream from these mutations has not been successful in treating uveal melanoma, the authors noted, the direct inhibition of oncogenic Gαq and Gα11 by this compound resulted in cell cycle arrest and induction of apoptosis. 1. Lapadula D, Farias E, Randolph CE, et al. Effects of Oncogenic Gαq and Gα11 Inhibition by FR900359 in Uveal Melanoma [published online ahead of print December 19, 2018]. Mol Cancer Res. OCT angiography (OCTA) may help assess risk for Alzheimer disease (AD), according to a study published in JAMA Ophthalmology.1 Researchers used OCTA to examine a number of optical biomarkers in people with known preclinical AD and others without AD, based on biomarker testing. They found that people in the very early stages of AD consistently had changes to the retina: The foveal avascular zone was increased and mean inner foveal thickness was decreased in the biomarker-positive group, compared with the control group. 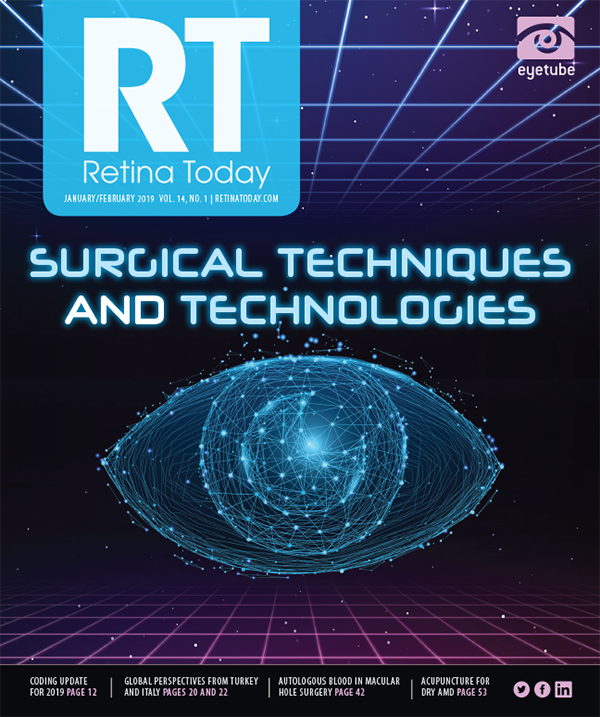 “This study suggests that cognitively healthy individuals with preclinical AD have retinal microvascular abnormalities in addition to architectural alterations and that these changes occur at earlier stages of AD than has previously been demonstrated,” the study authors said. 1. O’Bryhim BE, Apte RS, Kung N, Coble D, Van Stavern GP. Association of preclinical Alzheimer disease with optical coherence tomographic angiography findings. JAMA Ophthalmol. 2018;136(11):1242-1248. George A. Williams, MD, assumed the title of President of the American Academy of Ophthalmology in January. The term of service is 1 year. Dr. Williams, who has contributed often to Retina Today on topics related to advocacy and reimbursement, is a retina specialist and chair and director of the Department of Ophthalmology of Beaumont Eye Institute at Beaumont Health in Royal Oak, Michigan. Clearside Biomedical has submitted a new drug application to the US FDA for use of its formulation of triamcinolone acetonide for suprachoroidal injection (Xipere) in the treatment of macular edema associated with uveitis. If approved by the US FDA, the drug would be the first therapy for macular edema associated with uveitis, the company stated in a January press release. In the phase 3 PEACHTREE trial, the triamcinolone acetonide suspension demonstrated significant improvement in vision in patients with macular edema associated with noninfectious uveitis across all anatomic locations of uveitis. In addition, signs of inflammation resolved in more than two-thirds of patients receiving the drug, according to Clearside. Alcon has launched a new website (AlconScience.com) for US- and Canada-based eye care professionals and academic institutions. The website consolidates information about Alcon’s scientific, academic, and related activities into one portal, the company announced in a December press release. Visitors to the site can download clinically focused publications, submit grant applications for investigator-initiated trials, apply for independent medical education support, and apply for educational equipment donations, among other activities.